Simple keto desserts are great as substitutes for old favourites, since you can quickly make them when you need a sweet treat to satisfy cravings. These low carb sugar-free keto dessert recipes are all well below 5g net carbs per serving – nearly all are almost zero carbs. Most of these take less than 20 minutes to make, and no-bake. 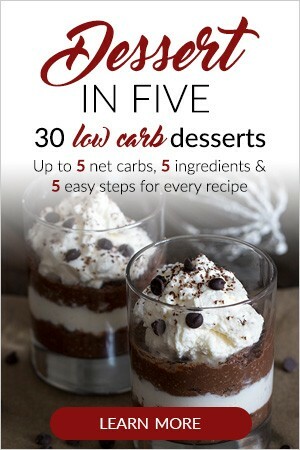 So, whether you love chocolate, cake or mousse, you should find a delectable almost zero carb dessert to enjoy guilt-free. One thing you do not want to do while on any diet is spend hours baking or cooking. And that’s especially true for desserts or snacks. If you’re after a quick and easy sugar-free dessert to make, try this keto cheesecake mousse. It will be ready in 5 minutes! Check out the Sugar Free Cheesecake Mousse recipe on Low Carb Yum. Here is another easy keto treat and this one will provide you with 20g of protein per serving as well. Find out how to make the High Protein Jello Mousse recipe at Two Sleevers. For a super indulgent and satisfying snack or dessert, this treat in a jar will have you covered. Check out the Keto Cheesecake In A Jar recipe on Sugarless Crystals. What’s for dinner? That question might be in your mind more often than not when you’re on a keto diet. If so, I highly recommend The Keto Beginning 30-Day Meal Plan. You will not only learn about the best way to make the transition to ketosis, but you will also get fabulous recipes for 30 days! Click here to buy it and start your fat burning journey now. The Keto Beginning – Start Melting Fat Today! Speaking of keto-friendly cheesecakes, check out the Easy No-Bake Cheesecake Bites recipe by The Mermaid With Muscles. You will not be disappointed. Let’s be honest, chocolate is the ultimate sweet treat and an old favourite. It is a creamy chocolate cheesecake with an Oreo-inspired base. You simply must try this recipe. Check out the No-Bake Chocolate Cheesecake-for-1 recipe on gnom-gnom. This zesty lemon Italian pudding is almost zero carbs and it’s perfect for summer. The whole family should enjoy this dessert, whether or not they’re on a keto diet. Check out the Low Carb Lemon Budino Keto Dessert recipe at Spinach Tiger. You didn’t think Tiramisu wasn’t keto-approved did you? It’s one of those heavenly desserts you can take with you to a get-together with friends or family and nobody will even know it’s low carb. Check out the Keto Tiramisu recipe at Keto Diet Channel. This mug cake uses coconut flour and sugar-free chocolate chips. And of course, you will have it ready in less than 5 minutes, making it perfect for a quick lazy Sunday keto treat. Check out the Chocolate Chip Keto Mug Cake recipe at Sugar Free Londoner.